At innermost we work with our designers to develop unique products using only the best quality materials combined with the latest innovative technology. Our products come with a genuine 3 year warranty as we have total confidence in their design and durability and are proud to offer our customers the best after-sales care. 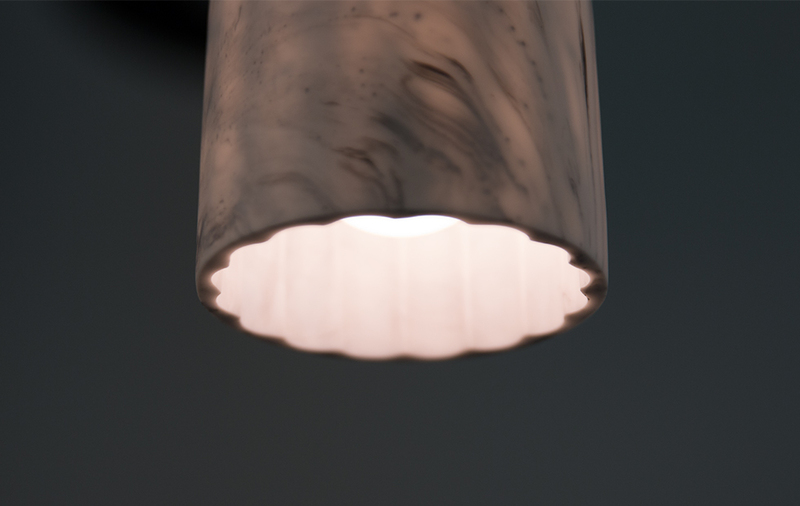 When you buy an original Innermost product you can trust in our high standards of intellectual property, ethical employment and environmental responsibility. And you can be sure that beautiful, genuine product will arrive in pristine condition. Unfortunately, copies and imitations of our products do exist on the market. Please beware of any fake products. – These counterfeits most likely offer no assurances of CE, ETL, or WEEE certification: all the stuff that ensures they are safe for use and safe for the world. – They rob designers of their royalties and can be crushingly harmful to the creative industry. – It is unlikely that VAT is collected or tax is paid so purchasing them does not contribute to the economy and puts local shops and jobs at risk. – The products are most likely not covered by any warranty, so money and time are wasted on replacements in the long term. 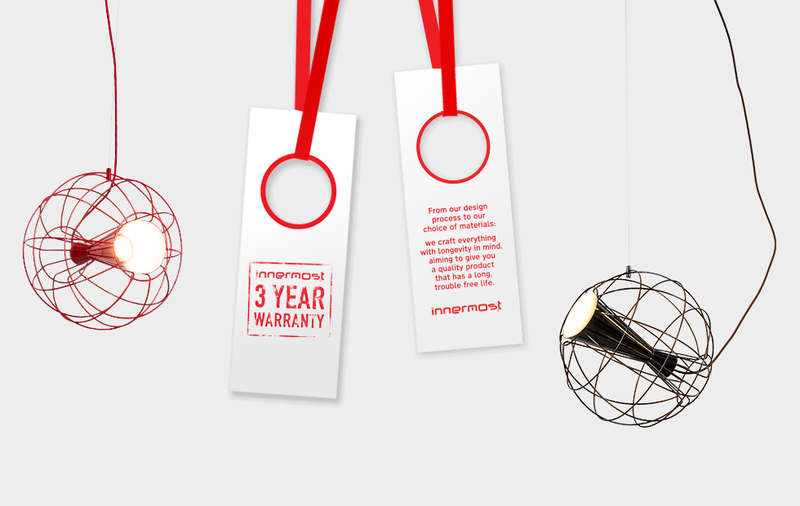 At innermost we want to continue to protect the IP rights of our designers and keep supporting creativity. If you are in doubt about the authenticity of a product for sale please let us know, we would be happier to offer you a discount for a genuine innermost product than for you to risk buying a dangerous imitation. Thanks for continuing to support Innermost and original design. If you are looking for new ideas for modern chandelier lights then let us inspire you with some alternative designs that will illuminate your interior. We offer a wide range of modern chandelier pendants that make a dramatic impact and will enhance your decor. Our modern designer lighting range uses the latest technology, so it can be integrated with your modern interior. This amazing chandelier creates a centerpiece for any space. It set the standard when it was devised by Tom Kirk for flatter format chandeliers, so this is a piece that will suit lower ceiling heights. It has since gone on to grace numerous interiors as the perfect centerpiece. Reflecting its surroundings via the hundreds of etched and folded strips at different angles around both its exterior and interior, the effect is like looking at glass or crystal until you get closer and realize it’s all perfectly polished metal. 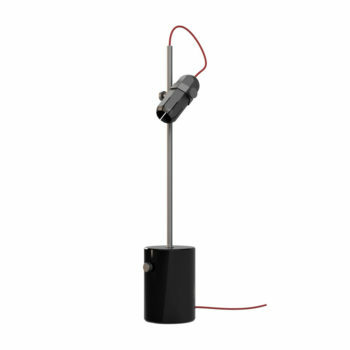 It is available as pendants of varying sizes and as a wall light in polished stainless steel, brass or bronze, giving you plenty of option if you want to integrate more pieces into the surrounding interior. Try Panel for an exciting modern chandelier pendant. This multi-faceted chandelier uses both polished and matt surfaces, inspired by contemporary jewellery as well as architectural metal cladding. 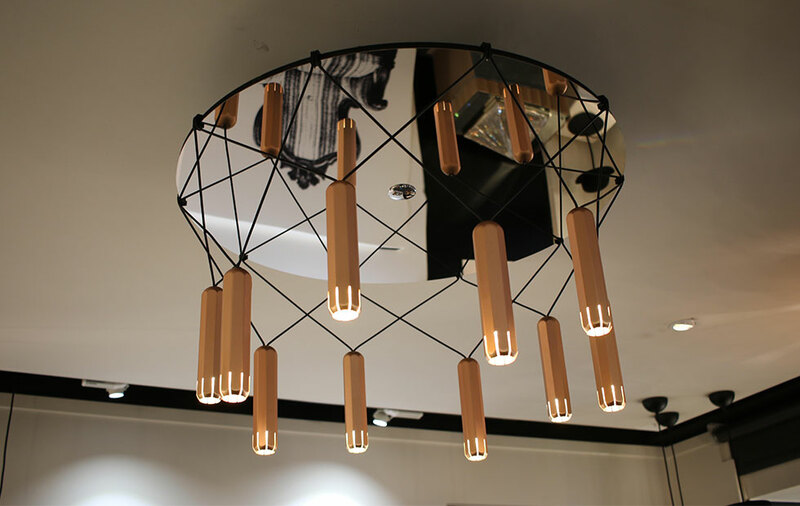 Designer, Steve Jones, layered a mix of finishes and forms to create this exciting chandelier with a contemporary feel. Panel reflects different sections of the interior it is placed in, so would make a great modern statement piece and something totally different from the usual traditional chandeliers. Use a cluster as a modern alternative to a chandelier in a hallway or above a dining table. 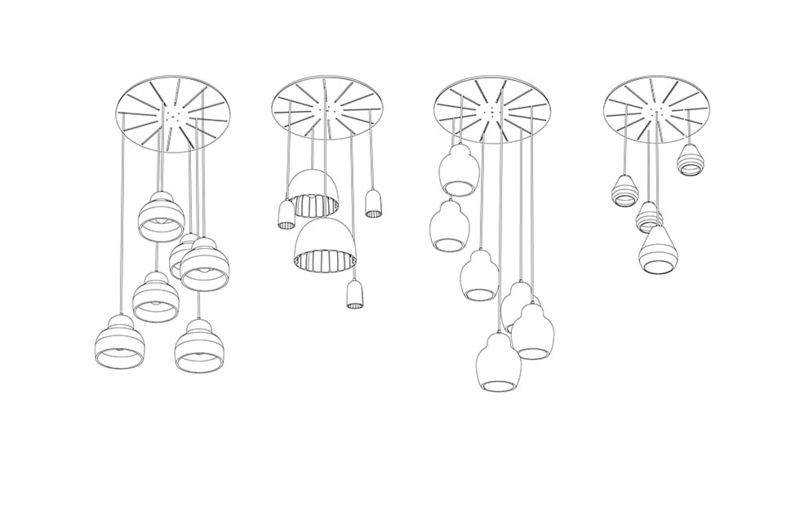 Our multifunctional ceiling rose, Radiate, allow you to hang multiple pendants in a number of configurations. 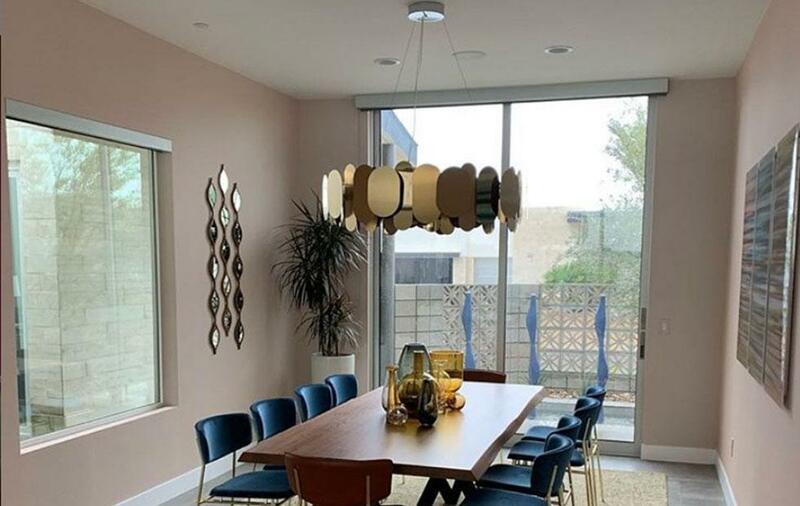 This means that options for a modern cluster chandelier are endless and you can achieve a dramatic designer lighting effect with a neat aesthetic that eliminates the needs for multiple ceiling roses. 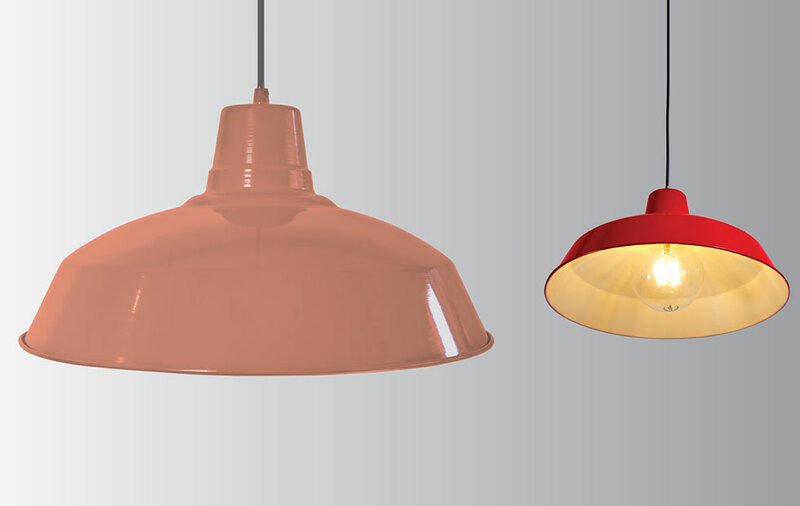 Radiate is compatible with all Innermost modern pendant lights and can be used with other designer fixtures. 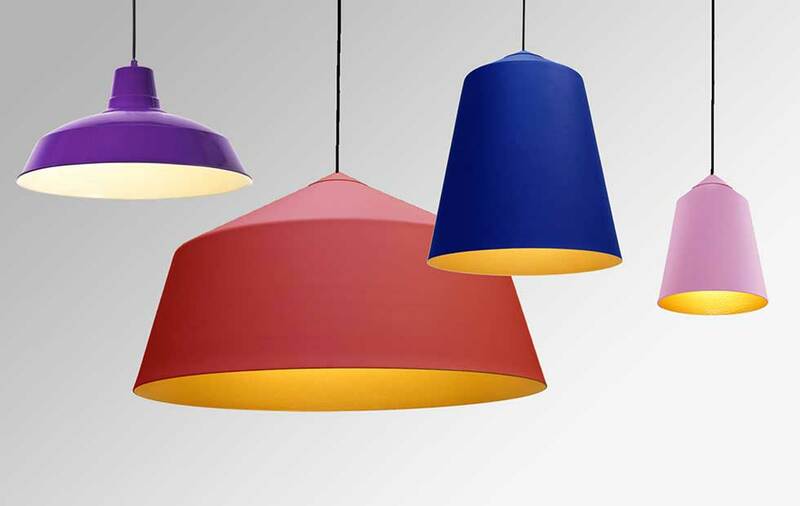 In the Spot Cluster, Brixton pendants are suspended around a circular disk. The clusters can be arranged in various patterns to give different design options. Arranged as a down-lit cluster chandelier, the cords themselves criss-cross to create decorative geometric patterns. This creates a truly modern chandelier effect and it can be tailored to the space that you have to fill. Consider the ability to easily adjust, dim or monitor your chandelier lighting. By selecting fixtures that can use bluetooth control, you make the lighting fit the changing atmosphere and mood. Innermost products can be paired with Casambi, which has a simple user interface that anyone can operate, via tablets, iPhones or switches. Great to visit the Fashion Lighting showroom in Taipei recently to see a variety of Innermost products on display, including the Brixton Cluster installed with a shallow drop format and alternating unit lengths. We’ve got some very exciting projects in the pipeline in Taiwan, we’ll share more soon! New, Post, Soft, Salvage, Heritage, Technical; the term ‘Industrial’ is constantly being re-defined with the changing style of this genre. With the ever-evolving parameters of what can be classed as ‘industrial’, the Innermost team have been debating and defining the many sub-categories that come under this umbrella term. 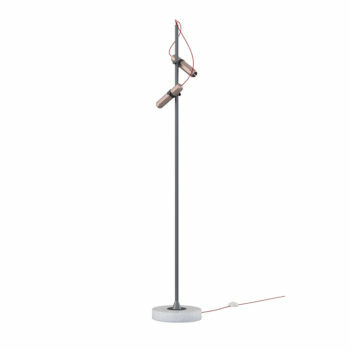 We have spent the last few months categorising the innermost lighting range to make products quicker to find, as well as give immediate visual suggestions for items by style or material. 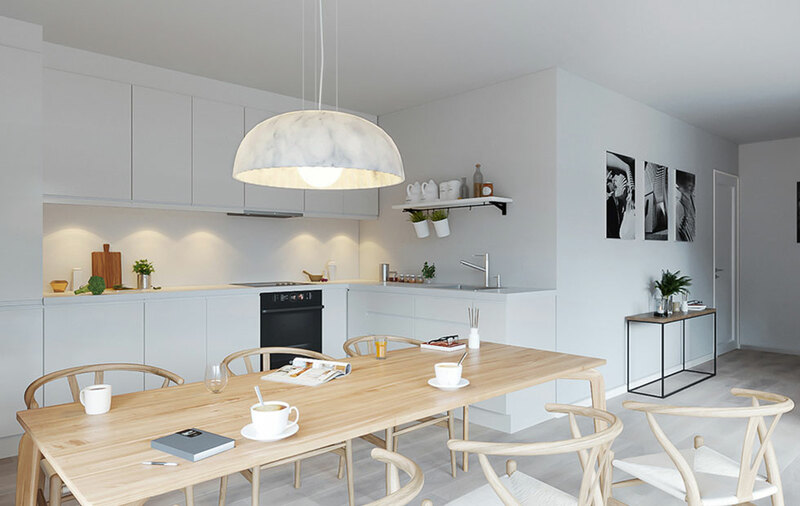 From Large & Luxury,to Glass, Minimal or Brass/Copper/Gold – we settled on some of the most popular categories and terms that are used to spec modern lighting. But one of the most debated was ‘Industrial’, a category that in recent times has really expanded to cover a variety of aesthetic styles. We often get asked for ‘Industrial’ though it came to light that our definition can be rather broad. One staple of this category is our latest addition to the collection, Foundry, an industrial item with sourced parts – that looks like something stripped out of a steampunk interior. But the category also extends to items like Lighthouse (part industrial, part science lab) or defined as ‘minimal industrial’ with bare bulbs and metallic finished bulb holders. The phrase ‘soft industrial’ (industrial that has been updated and modernised to make it less harsh- a term coined by industry guru Bobby Haidinger in the US market) can be used for products such as ‘Circus’, and then there is ‘modern industrial’ which references the modern tech industry. What is interesting is how the genres are now being mixed so that technical schemes are combined with some basic industrial styles and are also incorporating high tech chandeliers. The look could be described as ‘workshop meets control room’. Also interestingly, in some areas the reclaimed industrial look is also being mixed with high-tech modern chandeliers. This mixed modern lighting style all fits with the idea of zoning and the creation in many F&B interiors of what are really modern day ‘snugs’, an interior within an interior. The old fashioned ‘snug’ was a small alternative room in a British pub that was more like a cosy sitting room. It’s no longer just a thing in cafe and restaurant interiors, it’s also typical in the new shared workspace concepts that are in all major cities now, as well as inside meeting rooms and break out areas of traditional workplaces. In trying to make sure we have the entire product to provide for our clients projects we have attempted to map this and make it easily searchable. You can visit our recently updated website and see all we consider to be industrial with one click! We will also be expanding the industrial Foundry collection in the coming months with 8 new options. Keep checking our site for new additions to the categories and do join in the debate to define what important modern lighting categories you feel have emerged! 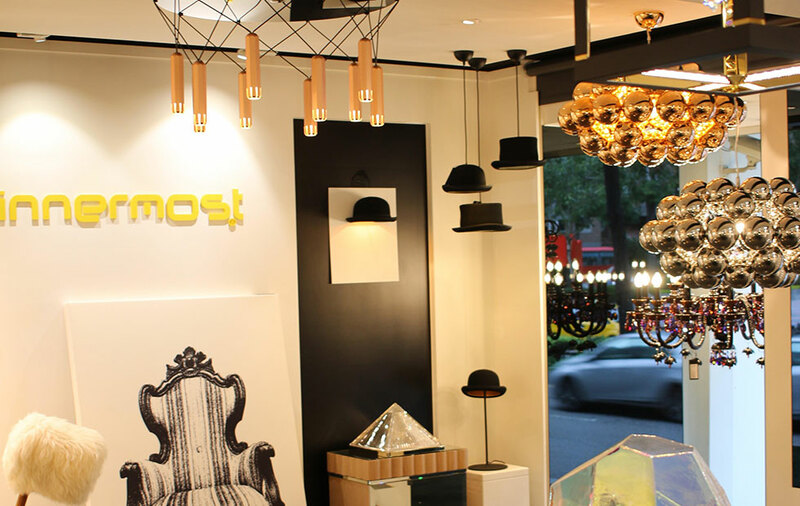 Innermost is a British design brand with a rebellious approach to lighting and furniture. Founded in London and working with designers from all over the world, Steve Jones and Russell Cameron aimed to create an innovative and diverse brand, making products of the absolute highest quality. Since 1999 the company has followed its initial philosophy, to be ‘as British as London itself’: a unique mixture of classic English tradition and vibrant global diversity. 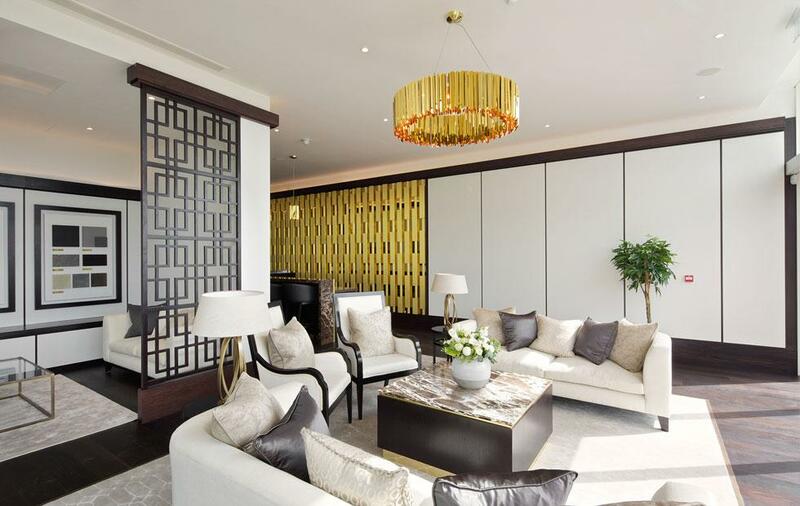 New technology is radically altering our interiors, all for the better, argues Steve Jones, co-founder of British furniture and lighting brand, Innermost. “For years tech got in the way; since the first electrification of houses, interiors have been filled with trailing cables and routing things via nails right until recent times when the computer and the mass of AV gadgets in our living rooms took over. I first started my career in the furniture industry designing office furniture for brands like Knoll and Vitra; back in the 80s and 90s, everything was about ‘cable management’ which really should have been called camouflage and control. When I look at modern office furniture I think today’s designers have it easy! I’m now in lighting and there is little in a modern interior – other than the air we breath – that affects our view of a space more than light. Little more than 20 years ago domestic lighting had little choice and aside from a few very high-end brands, the most control you could get was a rotary dimmer. 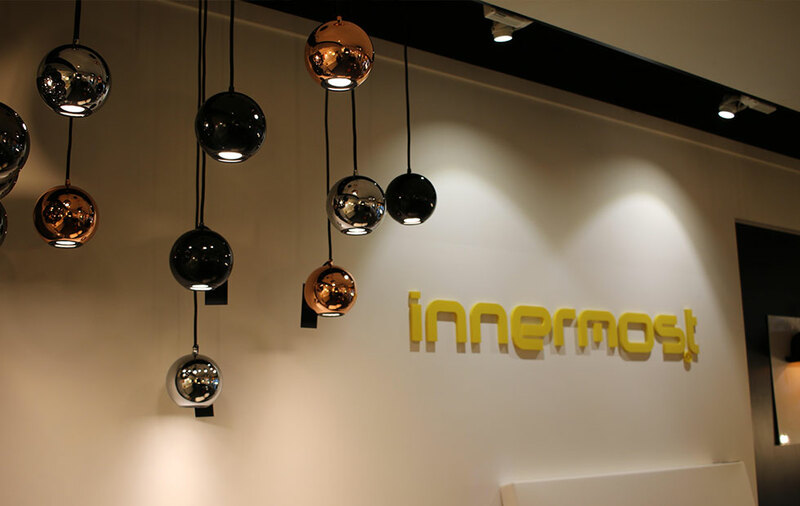 I remember when we first started Innermost and offered a dimmer unit on a product to a major UK retailer (who will remain nameless) I was told that it was a ‘luxury people won’t pay for’. Well 20 years later we are on the brink of a human-centric lighting boom and we now offer control systems that ‘people’ can control from their phones – and they love it. It’s changed not just the lights people choose but how they use them and even when. That same technology being wireless has not brought excessive cabling and this means the new tech isn’t just the preserve of new builds; you could put it into a grade 1 listed building without negative impact; no nails to bang. More than that I can’t remember the last time I used a light switch in my own home, I just have the app open. Will we remove light switches? It would certainly make decorating a lot easier. 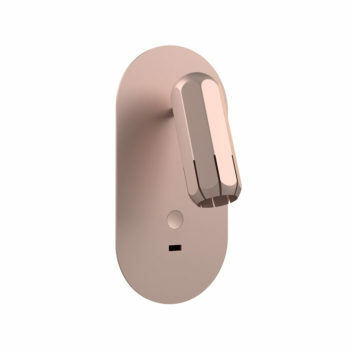 My son who was given the app when as a 6 year old he was still scared of the dark does delight in turning the lights off whenever a guest goes into the toilet – for that reason so we won’t be getting e-locks in our apartment anytime soon; another area where the traditional copper and brass hardware has given way to tech. I recall a report back when flatscreens were new that the demise of the cathode ray tube for brokers and bankers would free up 20% of all the office space in the city of London; dark predictions were made of empty office spaces and downward rents. That of course was ridiculous but in back to back desk layouts the idea that 20% of the space we had was dedicated to the CRT monitor was just something we’d got used to. It took a few years but the same thing then happened with LED TV’s in the home; our living rooms suddenly looked bigger. Now you can hang them on the wall and Samsung just showed a screen that blends into its interior; a product that really is there when you need it. Interior designers and architects now understand the issues and are seeing how they need to design to get the best; my feeling is that in the future we will not only choose materials based on how we need to route signals but that ‘data-flow’ analysis might become a thing. If it does then you read it here first. Simply we will require our designers to create spaces that allow data to move and things to be seen no matter where they are within the interior. I’m going to call it ‘Daflo’ analysis! Remember just before cell phones boomed and there were 10 different phone companies all installing boxes on the streets and we all groaned at the impact; then cell phones meant all of that was scrapped and in a way, we cleaned up our streets a little. For more from Steve Jones on Technology, Furniture & Lighting, follow him on LinkedIn. 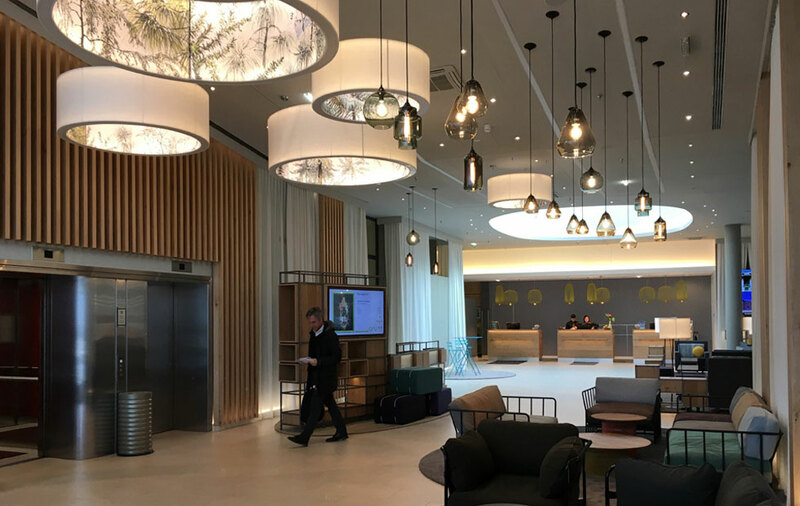 At Innermost we love a bespoke project and being challenged by our customers to achieve their exact lighting project specifications. We often create totally bespoke pieces for clients, but a big part of our day to day challenges include customising products from the range to create something of a different size, material, colour or configuration. We thought we’d share our top 5 contemporary lighting pendants that we get asked to modify most often, and what we change from the original. Most often adapted by colour – we get many requests for specific paint jobs on the Circus to match another hue in an interior. In fact, we get so many requests for personalising the colour that we are bringing out a custom colour service at the end of summer! We will offer 20 standard colours to choose from (and many more on request) with a quick turnaround and a minimum of only 1 unit..! This will be available on Circus, but also pendants such as Foundry. We are also able to change cable colours as well as the shades, so there is the opportunity to get creative with bespoke combinations. 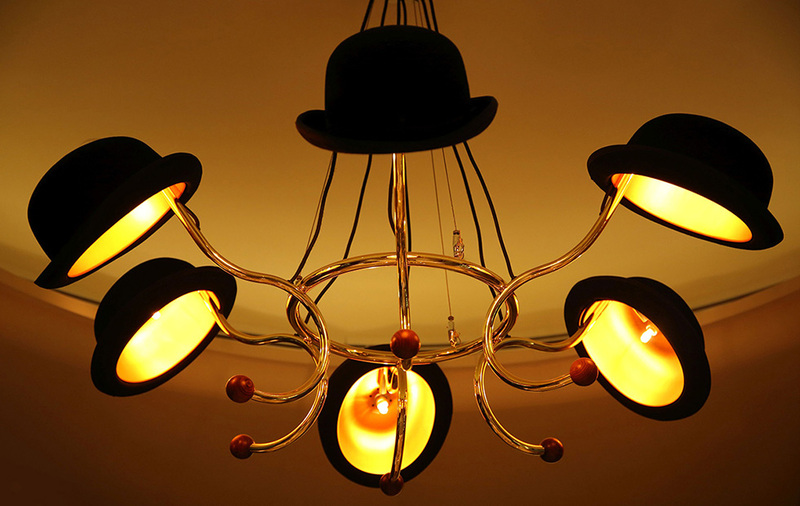 We often get asked to turn Jeeves pendants into unique chandeliers, which always look fantastic. Like this bespoke piece at the Lai Bun Fu Restaurant in Hong Kong. We are also often asked to change the interior reflector to match the decor of a project, such as above the mannequins in this Harvey Nichols store, which were changed from gold to silver. Snowdrop is available in a juicy selection of colours but we can also offer other variations! Change the colour of the ‘caps’, the ceiling rose or choose contrasting cables to make it your own. After 18 years, we continue to produce most of our lampshades in the UK, at our facility in Shropshire. This ownership over the entire allows us to guarantee the highest standards of quality, as well as giving us the flexibility to make a quantity of 1 to 1000+. 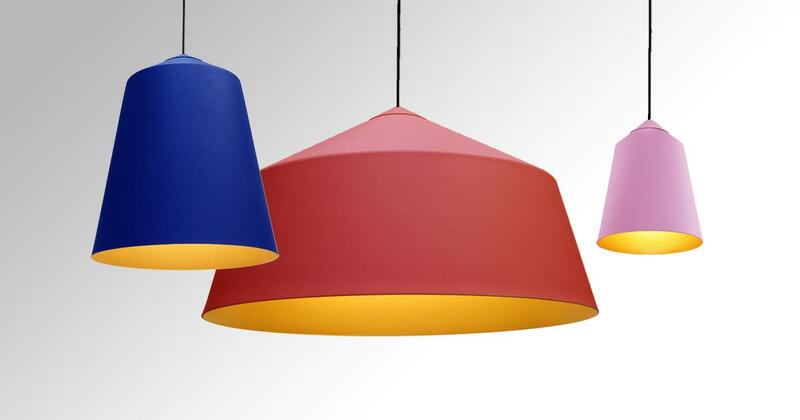 For lampshades, the possibilities are endless: we are only limited by your imagination! 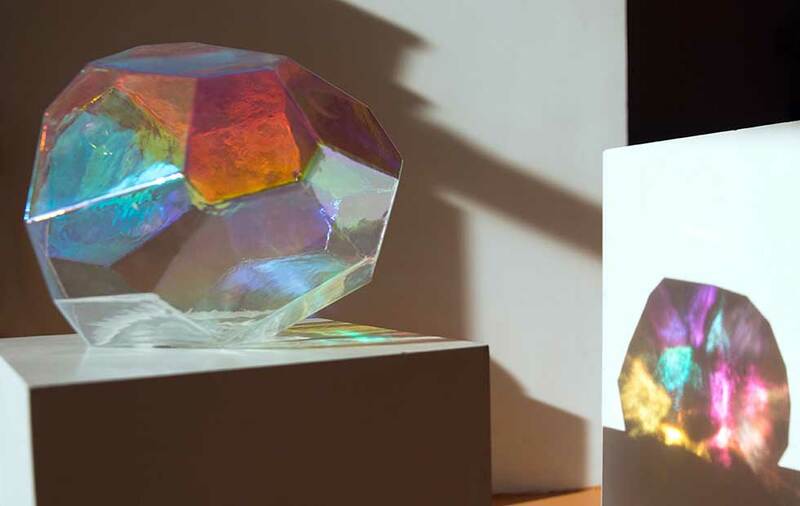 Asteroid is a product that is not inherently easy to adapt but it was in producing 2 ‘special requests’ that lead to the clear & dichromatic glass versions that are now a part of the range. These popular changes prove that even better versions can come out of initial ideas and we are always open to working with our clients to develop something new. 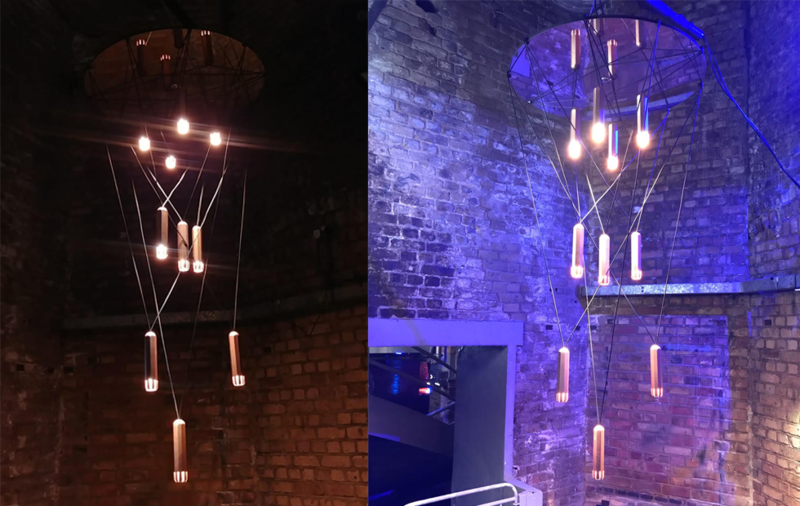 The custom colour Circus range and diachromatic Asteroid lights are just some examples where client input has initiated exciting & innovative developments. If you have ideas or requests for customised product, we would love to hear from you and for you to put us to the test! Lighting bars and restaurants correctly are essential for good ambience – whether the vibe is moody or bright, the lighting should be a key consideration. The temperature can change not only the way an interior feels but also the way that food is presented. Fine dining restaurants tend to use warmer lighting that creates a more cosy atmosphere, compared to fast food restaurants, which use bright, cooler temperature light to enhance a lively atmosphere and high turnover. It might sound basic, but taking the time to consider what temperature and effect are required is something that should be done early on. Don’t be afraid to use oversized pendants and large-scale clusters. Large overhead lights can be extremely successful if you have the luxury of high ceilings. The large Circus pendants at Euro Cucina restaurant look fantastic. If you want to incorporate colour, while not use lighting? Pops of colour suspended in the middle of the room can create a wonderful effect and bring interest to a more subdued or monochrome decor. The yellow Stupa with red cable brings fun and interest to this restaurant in Moscow. To create various ‘zones’ and give the interior a more boutique feel, don’t be afraid of mixing styles and types of fixtures. 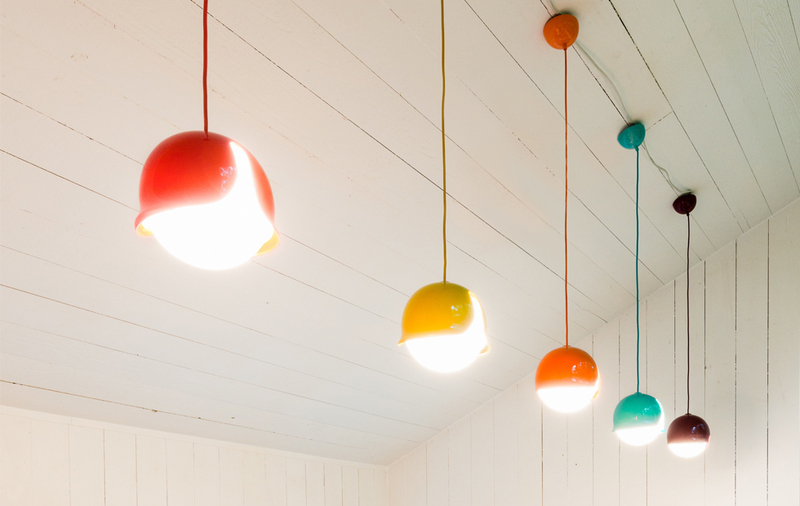 Modern designer lights can be playful and experimental while also be efficient and durable. Mix and match styles for a contemporary and dynamic effect, like the Beads and Buckle used simultaneously at the Gaucho Restaurant in Dubai. Consider the ability to easily adjust, dim or monitor your lighting. For example, select fixtures that can use bluetooth control, offering an easy way to make lighting fit the changing atmosphere and mood. Innermost products can be paired with Casambi, which has a simple user interface that anyone can operate, via tablets, iPhones or switches. If you will be using the space for various events, the ability to easily manipulate and change the light output will be invaluable. Lighting can make the project by bringing a new element of design, layers of light or a feature area. Don’t neglect it in your plans and research quality modern lighting for hospitality. Here are some great examples to get you started. Ensure the guests can read their menus! Though low-level lighting is great for atmospheric bars, it’s still important that customers can see what they are ordering at a comfortable level. Making guests get their iPhone torches out is not a good look! Test bulbs and the overall effect when it is dark outside to be sure you haven’t taken ‘atmospheric’ too far. Use contemporary spot lighting above tables. Using spot lighting above the tables brings focus to the meal and can look fantastic- just be careful not to blind guests. To give the right level of light and avoid blinding guests with glare, diffusers can be essential. This allows you to experiment with many different lamp shades while covering bare bulbs and providing a softer light. 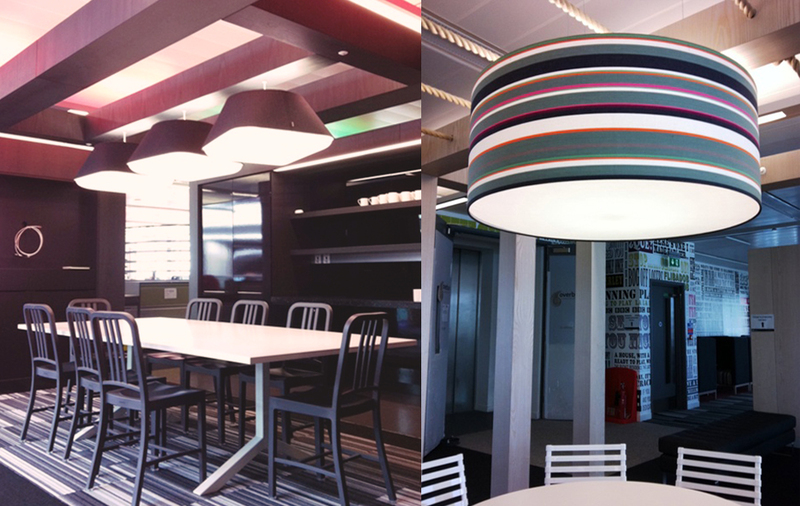 Innermost have a custom lampshade service and can provide diffusers for any design. Whether designing for a traditional or contemporary space the interior will benefit from good contemporary fittings. Ultra modern can create amazing contrast in a period interior and a bit of industrial grunge can work with polished modern surfaces and slick minimalism. 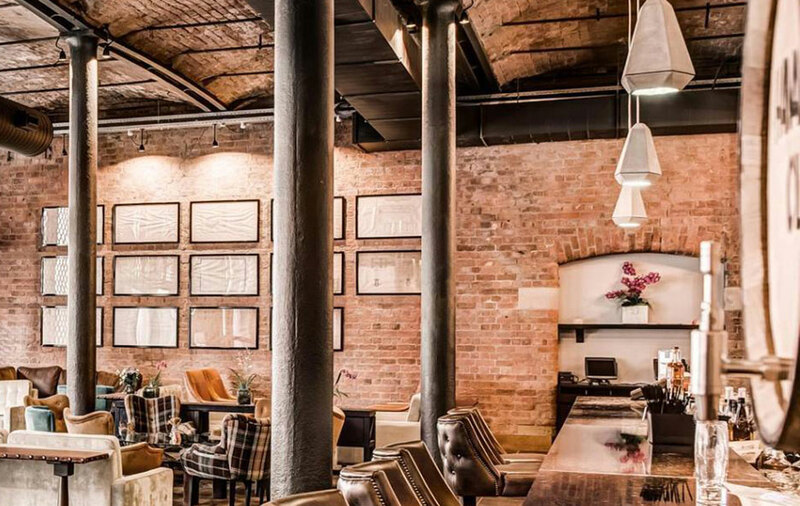 Lighting can make a huge difference to the overall feeling of your restaurant and bar is an investment in so at each stage be sure to consider the comfort and enjoyment of your guests. Do get in touch if you’d like any more advice or inspiration for your next project!